I'll give you a hint: "Pick me. Choose me. Love me." I love "Friends." It is one of my all time favorite television shows (I stopped counting how many times I have watched the entire series on Netflix). 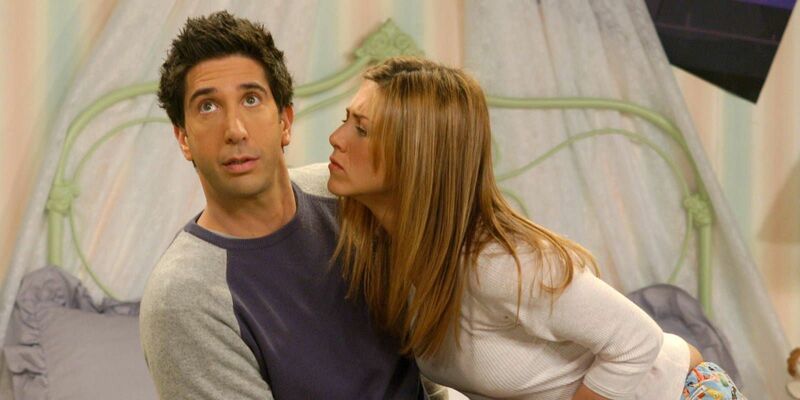 Despite my love for the show in general, there is one thing I cannot support — Ross and Rachel. They simply do not belong together. I bet I can think of a few more iconic couples. Cory and Topanga are childhood sweethearts. Their relationship flourished from a friendship to a relationship to a marriage. No matter what happened in life, they always found their way back to each other. They were able to be silly together, but still serious and romantic. Plus, who could forget when Cory's mom tried to tell Cory that there were other girls in the world and Cory said he only wanted one — Topanga. Meredith and Derek's love story is epic. Every road that is taken eventually leads them back to each other. They bring out the competitive edge in each other and, despite their differences, are hopelessly in love. Also, they got married on a post-it note *cries. * Pick me. Choose me. Love me. Nathan, the jock, and Haley, the geek, in a perfect romance. Despite the fact that they got married and pregnant in high school, they did not let it hold them back. They both pursued their dreams and always pushed each other forward. They are literally the definition of pushing each other forward. Cam and Mitch are both incredibly quirky, sassy, and sarcastic.... and they do it together. They embrace each other's weird habits instead of getting annoyed by them. Plus, there is the fact that Cam chose to be with Mitch even though he was scared of his family rejecting him. True. Love. Marshall and Lily (or, should I say, Marshmallow and Lily Pad). In the show about Ted and his romances, Lily and Marshall are truly the most swoon-worthy couple in the show. I mean, they bring each other a 6-pack to the airport. They always call each other during lunch to say what they are grubbing on and to say a mid-day "I love you." Let us be real — love is about the little things. Frank and Marie show that love is not necessarily boring after so many years of being together. They know how to quip back and forth with each other, knowing they won't hurt each other's feelings. Love isn't boring just because it is old. Jesse Katsopolis and Rebecca Donaldson. It is hard to even put their relationship into words. Just because 'life' starts doesn't mean that the fun needs to end. Becky and Jesse always make time for fun (whether it is childlike fun on the playground or, well, adult fun). No matter how long you have been with your significant other, you always want to look at them and think "Have Mercy!" Cece and Schmidt did not have the best start to their relationship (unless you think Cece repeatedly turning down and ignoring Schmidt a good start). However, their obvious differences eventually got set aside to reveal two people who truly complement each other. Schmidt views Cece as a queen and that's how your lover deserves to be treated — like royalty. Lucy and Ricky cannot be forgotten; they are the original iconic television couple. Their relationship did not try to sugarcoat love; it had the ups and the downs. However, at the end of the day, they were always there for each other and always in love. Not to mention that they met on a blind date; seems pretty relatable to the present day. Just goes to show that love is timeless.